When my editor at American Girl asked if I’d like to write a mystery about Josefina, I was delighted! This project combined several of the things that I love to learn about: history, people with different cultural backgrounds, and an intriguing and beautiful landscape. I started by reading all of the existing Josefina books. It was essential that I be respectful of the wonderful writing done by Valerie Tripp, who created Josefina. Then I began reading about New Mexico history. 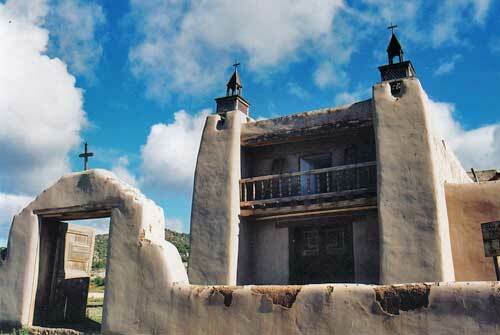 But before going too far into my research, I needed to travel to New Mexico and experience Josefina’s terrain myself. 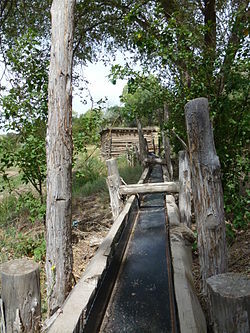 My first stop was El Rancho de las Golondrinas, a wonderful living history museum near Santa Fe, Mexico. I knew that a visit to El Rancho de las Golondrinas would give me a great glimpse of what Josefina’s rancho would have looked like. 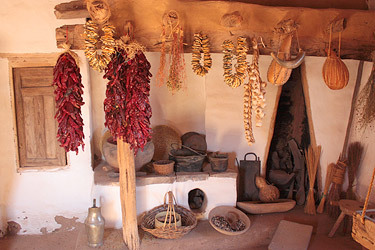 The historic rancho dates from the early 1700s, and was an important stopping point along the famous Camino Real, the Royal Road from Mexico City to Santa Fe. These are the kind of carts traders used. The wooden wheels made so much noise that they could be heard for miles! The house was built around an inner courtyard. 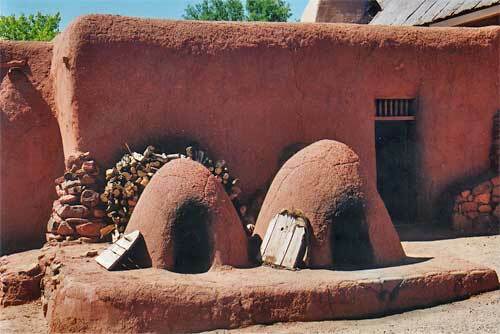 These domed bake ovens are called hornos. 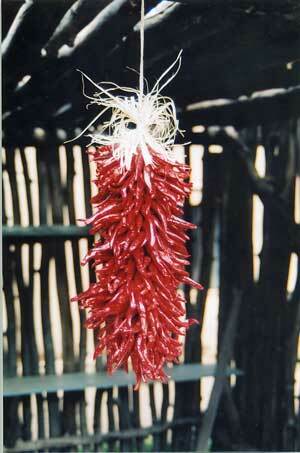 I found the strings of hot peppers called ristras so beautiful and interesting that I wrote them into a scene. 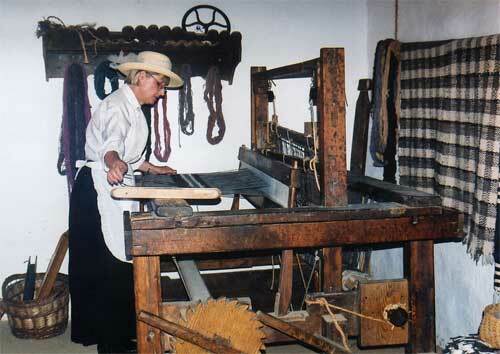 A guide demonstrated how an old loom worked. 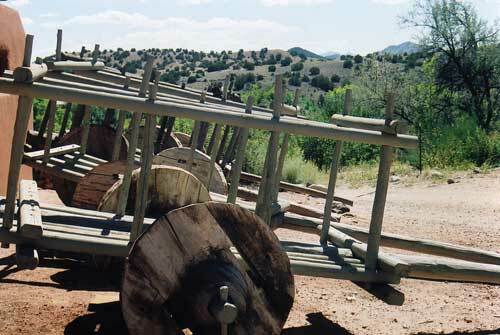 (This style of loom is different than the Navajo loom Teresita uses in the Josefina books.) The weaver works standing up. Aren’t these colors beautiful? 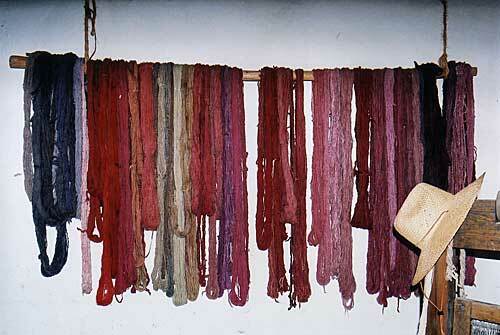 They were created with natural dyes. Next, I went exploring. The New Mexico landscape is very different from what I know at home in Wisconsin! I took several hikes, imagining Josefina traveling with her aunt to look for medicinal plants. 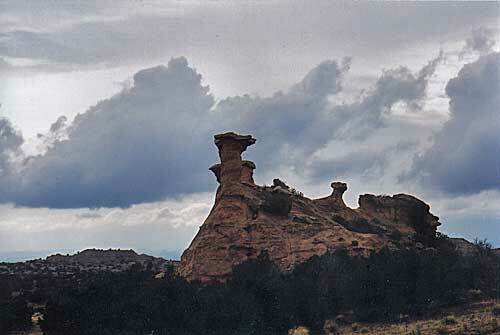 I was so impressed with some of the rock formations I saw that I decided to use one as a clue in the story. This photograph was taken late in the day, and doesn’t do justice to the beauty. I visited several very old churches so I could study the architecture and construction styles. 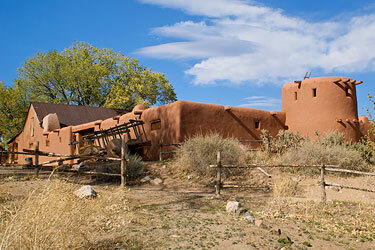 How does this adobe compare to the materials used to construct old buildings in your area? What resources were available? 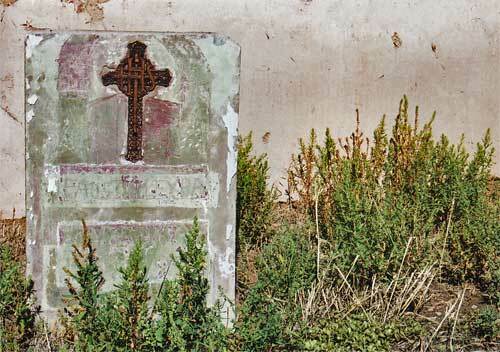 If you’ve read Secrets in the Hills, you already know that a gravestone in the churchyard plays a role in the mystery. While in New Mexico I also visited several traditional museums. 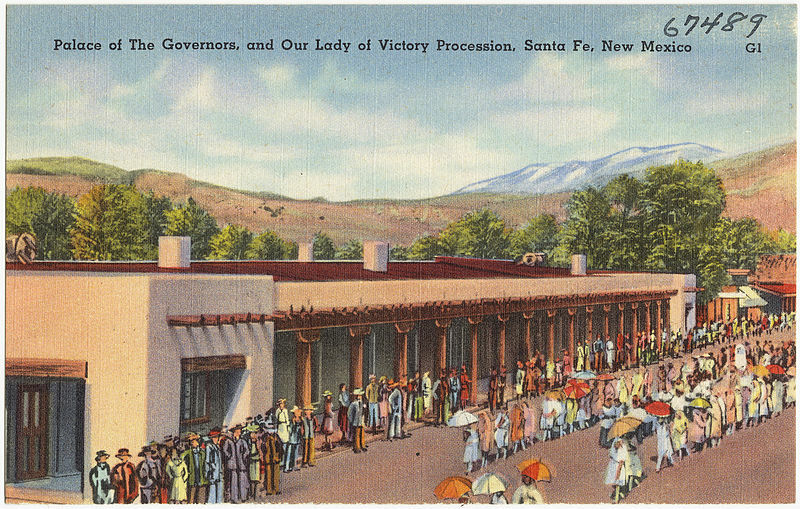 The old postcard below shows the Palace of the Governors in Santa Fe, which is now full of exhibits about the region’s history and culture. The hand-made malacate (spindle for spinning wool) described in Secrets in the Hills is just like an old one on display in Santa Fe. I found more inspiration in New Mexico than I could fit into one book. Why not try writing an historical story set in your community? Visit an historic site or museum and see what sparks your imagination! This entry was posted on July 28, 2013 at 10:30 am and is filed under El Rancho De Las Golondrinas, Palace of the Governors, Secrets in the Hills. You can follow any responses to this entry through the RSS 2.0 feed. You can leave a response, or trackback from your own site. I’ve traveled extensively in New Mexico but missed El Rancho de las Golondrinas..it’s now on my list to see on another trip! I think the Josefina stories will interest my granddaughter before long since NM is part of her heritage! I continue to be very impressed with your generosity in your “25 in 25” giveaway. Arletta, I suspect you’d enjoy a visit to the Rancho very much. It’s actually quite a large site – I only shared a bit. I hope to return again some time. Dan and I would love to add this to our library and would share it with our granddaughter when she is older. Thanks, Ruth! The characters and settings become real in my mind, so I hope that comes through to readers as well. Kathleen, I’m really curious about what the American Girl series is all about. I’d still like to blog with you about related products like the dolls. Dani, I’d be happy to do that. My schedule is truly crazy for about another month, but let’s plan to connect some time after that. Awesome, Kathleen! Your work speaks for itself — very cool! I love YA literature — this looks like one my granddaughter would love! Hi Gail! I know we share a love of YA lit, and I’m happy to add your name to the hat. My granddaughters would love to own this book. My daughter and I visited the Palace of the Govenors on a trip we took when she turned 18. The place is truely inspiring! Please enter my granddaughters Natalie & Gloria. Natalie and Gloria are entered! Please enter me. I’m actually in the middle of reading this one. I started reading it when my daughter brought it home from the library a few weeks ago, but somehow never finished. Thank goodness this post is relatively spoiler-free. I need to put aside my “adult” reading and find out about the treasure!